It's almost about 9 months ago since Samsung released some new colors for the Galaxy S III Mini hers. At that time, Samsung issued 4 colors at once, ie, Garnet Red, Titan Gray, Amber Brown, and the last is the color of Onyx Black. It seems that Samsung began to feel that the potential buyers of the Galaxy S III Mini necessary to'' called'' re-think his interest by way of releasing a new color, which is blue. Twitter account @ evleaks have leaked the appearance of the phone that has lower specs in a smaller size than the Galaxy S III is wrapped in a bright blue color. 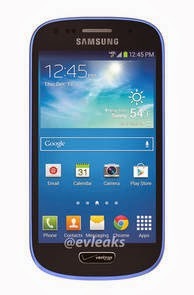 Unfortunately, there is no further news about the planned release date of Galaxy S III Mini is colored blue. We look forward to it presence.